As well as trying to settle into life as a law student again after so long and also adjusting to life back in the uk after my missionary trip to Rwanda this summer i have been having some tech issues in that my laptop wasn't working for a while then it decided that it doesn't want to recognise my sd cards anymore etc. Had i had to deal with each thing individually i think i would have done amazingly well but everything together has meant that i had my first anxiety attack in years just the other days and i am panicking a lot in my everyday life now. Small little things seem to be getting to me. But c'est la vie! I thought to get back into my blogging again i would share with you all a fun day out i had pre Rwanda when i went down to London and met up with two of my old time best friends. 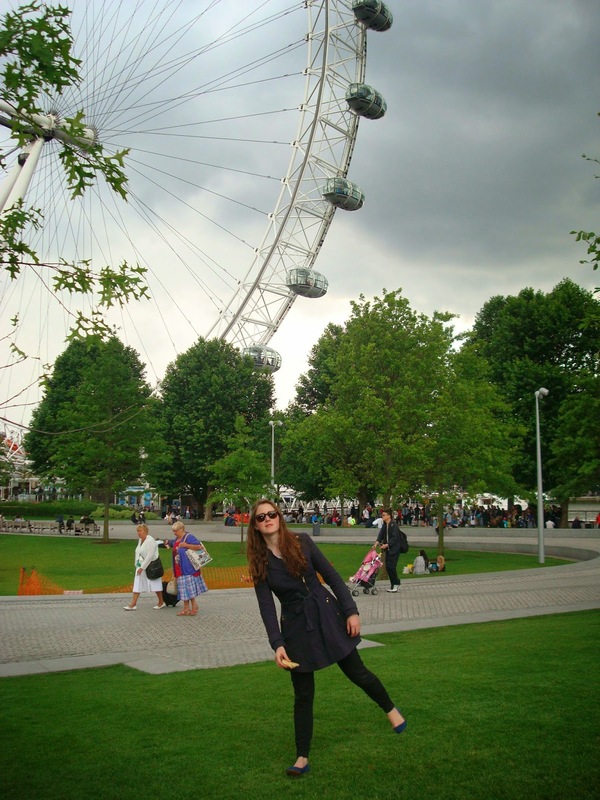 Me and my friend Anna chilled by the embankment with the London eye right in front of us and we had a mini picnic with hummus and fresh bread whilst catching up on whats going on in both our lives. As i live in nottingham and she in London we don't often get a chance to see each other and it was just nice sitting there relaxing and talking. Thats one thing i hate about growing up. All your friends move away and its not the same as when you were in high school and saw each other everyday at school and after school and talked on the phone most nights as well. But i guess life is simpler when you are younger and everyone has less responsibilities. Later on we went to this amazing little south american restaurant in south east London called Cubana which is right next to the old vic by waterloo station. The cocktails there were so nice as was the finger food we tried. We had the falafel, sweet potato chips and i think vegetable homemade crisp. Its was as good as it sounds!! The awesome thing about them as well is that all the food is made fresh and is free-range and its all local since its from British farms as well. Since it was a work day we decided to have the mocktails and the mojito was simple amazing even with no alcohol. Might have found a new fav cocktail. I kept my outfit really simple and as per i was in all black but i did add some colour with my blue strappy sandals which i simply adore. I also borrowed this lovely scarf from Anna to wear just in case it got a bit nippy later on in the evening. I am slowly getting organised again but law school is intense this year so the posts might be sporadic for a while. I hope that you are all well and thank you so much for baring with me. It gets better i promise :). How have you all been settling i after the summer?